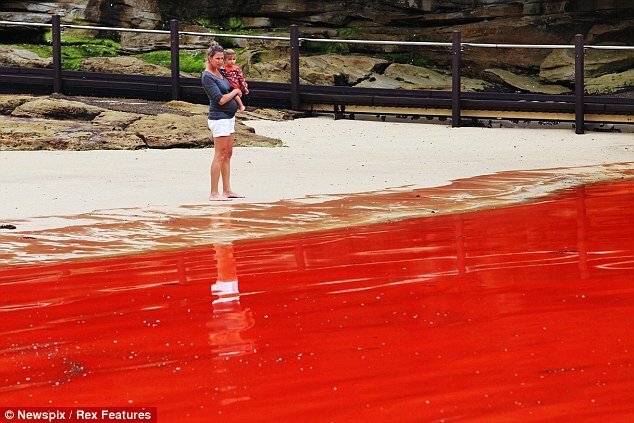 Tourists heading for famous Bondi Beach were left high and dry today after a rare natural phenomenon turned the water blood red. Bondi was among several popular beaches in and around Sydney, Australia, which had to be closed after a huge algae bloom transformed the sea into something resembling a scene from a Jaws movie. But despite the warnings a number of intrepid beachgoers were seen venturing into the water and swimming through the red surface, Ten News Sydney reported. The natural phenomenon is caused when algae, a plant-like organism flourishes and large groups of the miniscule plants, which can appear in various colors, gather together often with spectacular results. Known as Nocturnal Scintillans or sea sparkle it has no toxic effects but people are still advised to avoid swimming in areas with discolored water because the algae, which can be high in ammonia, can cause skin irritation. British tourists were among large groups of visitors who were told by lifeguards not to enter the water until the all-clear was given because the algae can irritate the skin and cause other health problems. Local lifeguard Bruce Hopkins said: “It has quite a fishy smell to it. The algae has already disappointing thousands who had headed to the coast to cool off as the summer Down Under finally gets under way of a prolonged cold period. The New South Wales (NSW) Office of Water has been carrying out a series of tests to discover what caused the bloom. One theory is that it was caused by an upwelling of colder nutrient-rich water. A spokesman said that the blooms, sometime referred to as “red tides”, are more common around spring and autumn when the water temperature is higher and there are greater movements in ocean currents. Large numbers of fish are believed to have perished from the effects of the algae. A spokesman for the local council said red algae could be dangerous to some humans exposed to it. “There are some possible risks to human health including skin rashes and eye irritation and for this reason the beach will remain closed until the algae dissipates,” he said. Tourists and locals are hoping that the algae will have dissipated by the weekend, when temperatures are expected to reach 40c.